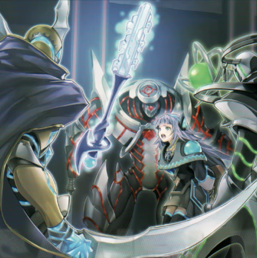 "Mekk-Knight Blue Sky", "Red Moon", and "Green Horizon" cornering "Ib the World Chalice Priestess" in "World Legacy Key"
"Mekk-Knight", known as "Jack-Knights" (ジャックナイツ, Jakkunaitsu) in the OCG, is an archetype largely comprised of LIGHT Psychic monsters (with one Cyberse and one Machine as an exception) debuting in Extreme Force. The archetype is both related to, and supported by, the "World Legacy" archetype. Each Main Deck monster has a color of the rainbow that appears in the artworks of "Mekk-Knight Spectrum Supreme" and "World Legacy Puppet". Thus the archetype relies on Special Summoning high level monsters while there are two or more cards in the same column to swarm the field and generate hand advantage. "Mekk-Knights" has a Kozmo Town-like recovery method in the form of "World Legacy Key". The Field Spell is very powerful against Extra Deck reliant Decks; but otherwise fares poorly against Deck (or Deck variants) with no Extra Deck monsters such as Kozmo, Monarch, BLS, Nekroz, or True Draco and is resource-intensive. Cards that prevents the player from Special Summoning can hurt the Deck's capability to swarm. Examples include the "Vanity's" series, "Archlord Kristya", "Heat Wave", etc. "Ally of Justice Catastor" can instantly destroy this archetype's monsters since they are all LIGHT monsters. "Lose 1 Turn" make "Mekk-Knights" more vulnerable to destruction. This page was last edited on 27 February 2019, at 04:24.